Based on the research from this. Keep in mind that some of these names are fanmade, not canon. Based as of chapter 873. The colors of the lines make it hard to read. 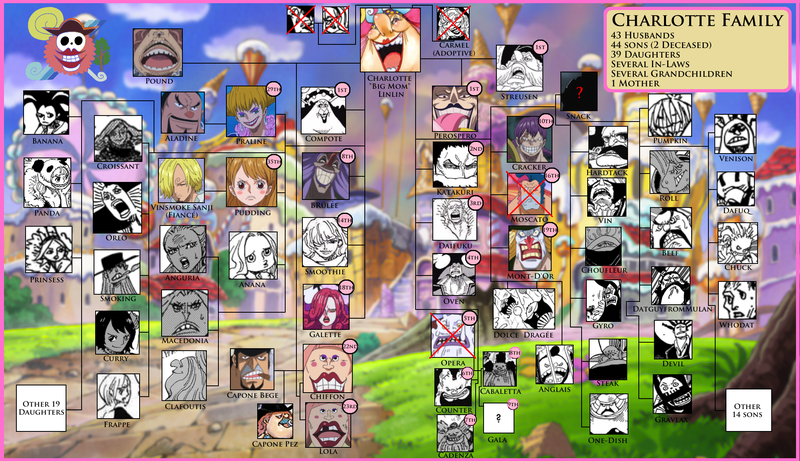 Hmm, does this: https://onepiecethenewworld.files.wordpress.com/2017/08/charlotte-family-copy.png work better? I’ve been considering that, I already have one (https://www.youtube.com/channel/UChbPNYQcJKpSERQZWA9BOqA) but I barely used it. That said this year I should be more free, so I’m hoping I can make it active again! but I think you missed some folks like some of the people in the enraged army (oda even revealed the names of those snake neck twins that laughed at Luffy in the new SBS), plus there were a bunch of other unnamed kids that were with Ananana and Anglais before Big Mom had lunch with Germa 66. Thanks! Just read the SBS, Oda’s timing never fails to screw me up! It also revealed the age of Smoothie among others (not to mention the Katakuri Paramecia fiasco), so I’ll have to add in those details. I completely forgot the other kids with Anana though, I definetely have to add those, thanks!